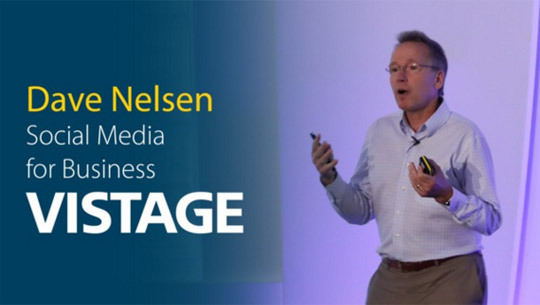 Award-winning speaker, consultant, and entrepreneur Dave Nelsen helps leaders of small and midsize businesses (SMBs) attract more customers, be more productive, and lead better teams. Every day, half of all Internet traffic starts with a search. More than 75% of these searches are free (and can’t be purchased). The most effective way to get more of this inbound traffic than your competitors is to implement a compelling social marketing strategy. Content isn’t king; content that is valuable to your target audience is king! Steve Jobs and Apple changed everything, not when they released the original iPhone, but when they opened it up as a platform for apps. Today, both Apple iOS and Google Android (hey, being a fast follower can be a great strategy, too) support more than 2 million apps. Your team can be far more productive and effective by using the right handful of these. "Dave Nelsen has a unique ability to tackle an issue and distill it down to its core elements. I believe that virtually any business would benefit greatly from Dave’s unique perspective." "Dave Nelsen has mastered the science of using social networking and social media for helping companies create conversations that build their brand, create loyalty, and achieve competitive advantage." "I highly recommend Dave as the rare, true expert in social media; he provides a unique and practical perspective into how to utilize these tools for business advantage." "Dave not only understands these new tools, he also understands how to improve business performance using them. I unequivocally recommend Dave Nelsen for any business seeking to use social to grow profits." "Dave understands the myriad social media and Internet tools and how they bring value to companies seeking to connect with customers, prospects, and employees. His approach is ROI-based." "Given his experience as a CEO and social media pioneer, Dave creates successful new media strategies that escape those who aren’t fluent in both the corporate and new media worlds." "Dave presented Social Media For Business to my CEO group and hit a home run. In 11 years we've had 100 world-class speakers; only six got perfect 5 ratings. Dave was the 7th. He will really open your eyes." "Dave Nelsen possesses a truly profound understanding of both new communication technology and exactly how that technology can impact group dynamics and behavior in society and in business."